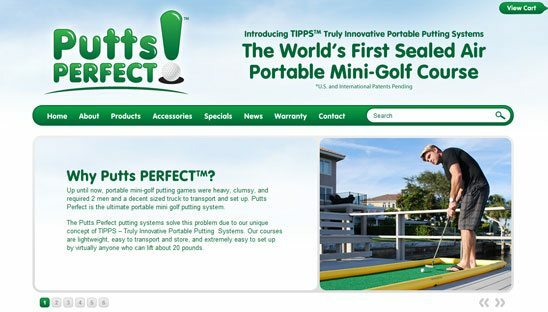 The Putts Perfect mini golf system is a new inflatable creation that is focused on bringing about a quick and reliable solution to the demand for portable mini golf putting courses available on a commercial basis. Up until now, portable mini-golf putting games were heavy, clumsy, and required 2 men and a decent sized truck to transport and set up. Putts Perfect is the ultimate portable mini golf putting system. Putts Perfect hired us to create a package deal including a full WordPress Eccomerce website, custom twitter page, branding and logo design. We’ve designed many projects for the inflatable industry but this project was by far our favorite. We were able to turn the wordpress site into a Eccomerce using the combination’s of plugins and 1shoppingcart. Check out the site and lets us know what you think! !